This group of black crappie came from a small central Kentucky lake last week. Smaller waters across the state offer productive crappie fishing right now for anglers who fish from the bank or from a small craft such as a johnboat or kayak. FRANKFORT, Ky. – The wild striped bass in a ginger and red wine sauce at a restaurant in New York City runs $135 before gratuity. At a Japanese restaurant in the same city, a dinner of sushi costs nearly $600 per person. These are some of the highest rated and expensive restaurants in the country, but we in Kentucky have a world class fish dish that is likely as delicious as those from a highbrow restaurant that is practically free by comparison. It costs some time along with a few dozen small minnows or a bag of 2-inch chartreuse curly-tailed grubs. This outlay yields a plate of delicious fried crappie filets to go with homemade potato salad, baked beans and cole slaw, one of the best meals found anywhere at any price. You also don’t have to own an expensive boat to catch crappie in Kentucky right now, either. Many of our smaller waters across the state offer highly productive crappie fishing for those with a canoe, johnboat, kayak, float tube or anglers who fish from the bank. Central and northern Kentucky anglers have four excellent small lakes to catch numbers of crappie this spring. Ninety-two acre Boltz Lake and 134-acre Bullock Pen Lake, both in Grant County, as well as 183-acre Kincaid Lake in Pendleton County and 158-acre Beaver Lake in Anderson County all offer fast action for crappie right now. Crosby said anglers can help all three of these lakes by eating some of the crappie in them, freeing up food for the remaining crappie to grow larger. Local anglers report catching nice 9- to 11-inch crappie from Beaver Lake on lime green with metal flake 2-inch curly-tailed grubs rigged on 1/16-ounce leadheads. Fish weed edges and woody cover on this lake for a mixture of white and black crappie. Cedar Creek Lake is known for producing some robust largemouth bass, but the crappie population in the lake gets better with each year since the removal of the 9-inch minimum size limit in 2008. This angler caught them on pink crappie jigs, but live minnows fished under bobbers from 6 to 8 feet deep are fooling many nice crappie in the lake. Black crappie prefer clear water and the areas of the lake with less stain in the water make the best fishing spots at this time. The fisheries division stocked 21,000 rainbow trout in Cedar Creek Lake earlier this year, providing an excellent bonus fishing opportunity. Anglers fishing the bank access areas on the lake should catch some trout by tossing white in-line spinners. Shanty Hollow Lake contains 185 acres of water in Warren County and holds an excellent population of white crappie from 12 to 14 inches long. Kentucky Fish and Wildlife placed brush, brush reefs and Christmas Trees in Shanty Hollow near the boat ramp on KY 1592 (Shanty Hollow Road). Eastern Kentucky anglers should hit 710-acre Carr Creek Lake in Knott County for both white and black crappie. 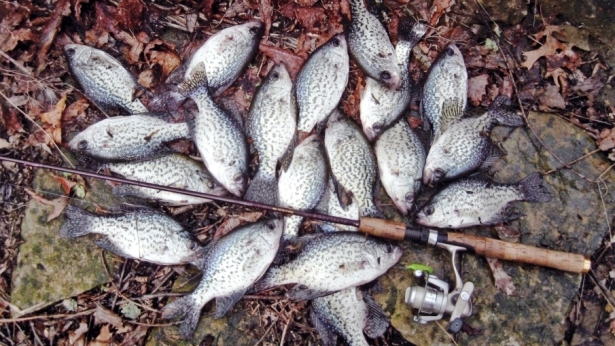 The white crappie in Carr Creek can reach 16 inches, while the black crappie mainly run from 9 to 12 inches long. The lake has a 9-inch minimum size limit on crappie. Fisheries personnel placed a mixture of pallet stacks and Christmas trees for habitat in Carr Creek and hinge cut trees along the shoreline. Anglers should probe these areas with live minnows, 2-inch chartreuse curly-tailed grubs or blue and white tube jigs rigged on 1/16-ounce leadheads for crappie. Just like on Shanty Hollow, the GPS coordinates of these fish holding structures are on the fw.ky.gov website under the “Where to Fish” tab. Crappie time is now on these smaller waters. All you need is some time along with a few lures or minnows to catch the makings of a world class meal. You will also need a valid Kentucky fishing license, as the new license started March 1.